By George Friedman – GeopoliticalFutures: Anyone who has ever been to a meeting knows that meetings are often confounding, frustrating affairs. Most of them are designed simply to be held. The people who attend them are unlikely to agree on anything except maybe the date the next one will convene, and the possibility that they accomplish something gets smaller as the meeting itself gets larger. 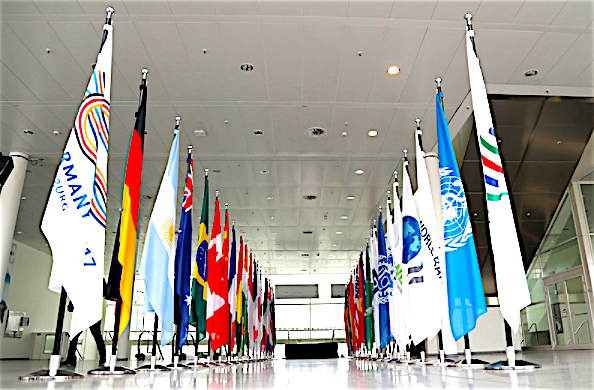 The G20 summit, which will be held today July 7, is no exception. But that’s only because the people who attend it, the leaders of the countries with the world’s 20 largest economies, think of themselves as decision-makers when really they are hostages to history. In fact, the dynamics involved at a meeting such as the G20 are indifferent to the people who attend it. Personalities are interesting but ultimately indecisive in power politics. World leaders may not like Donald Trump – in fact, many do not – but since they cannot avoid dealing with the United States, still the world’s only superpower, they cannot avoid dealing with its president. The United States is inextricably linked to three major issues that will be addressed but probably not resolved at the G20 summit. The first is the progression of North Korea’s nuclear weapons program, an issue the United States and China simply cannot ignore or fully resolve without at least talking to each other. On July 4, Pyongyang tested a missile it claims was an intercontinental ballistic missile. The North Koreans may be exaggerating, of course. The missile still needs guidance systems and a configured payload, but as U.S. Secretary of Defense James Mattis said, the United States can’t wait for North Korea to have a functional ICBM. Here again, personalities matter less than imperatives. The Trump administration had planned for an economic confrontation with China, at least if statements from the campaign were to be believed. The reckoning has been postponed now that Washington needs Beijing to persuade North Korea to abandon its nuclear weapons program. So far the talks have been futile, and it’s unclear if China even wants them to succeed. If the United States attacks North Korea, China could get what it wants – North Korea without a nuclear weapon – without lifting a finger, superbly positioned thereafter to play the role of peacekeeper against the belligerent United States. In the meantime, Chinese President Xi Jinping will promise to try harder to disarm North Korea because it strengthens his case if the U.S. attacks while he is “negotiating.” Washington probably sees the trap China is trying to set but can’t really get around it; it will simply remember this later, after the North Korea issue has been resolved one way or the other, when it turns its attention back to Beijing. After all, the U.S. can damage the Chinese economy far more than China can harm the American. World leaders take their relationships with other world leaders very seriously. To them, their relationships with their peers define their national interest. Though this line of thinking is misguided, it has its advantages, given Trump’s apparent unpopularity. Xi will blame Trump for disrupting a nearly successful peace process in North Korea. Putin, in an effort to dispel rumors of collusion, will blame Trump for conspiracies against Russia. Merkel will blame him for disrupting U.S.-German relations. Trump’s personality, however, will no more define what happens at the G20 summit than his healthcare views will define what emerges from Congress.